Denmark Museet for Samtidskunst, Staendertorvet 3, Roskilde | http://samtidskunst.dk Slovenija CSU Vodnikova domačija – Vodnikova 65 – Ljubljana| Valerie Wolf Gang, Erjavceva 1b, Mengeš, http://www.valeriewolfgang.com China Lopuma Jia, 105 taiyuan Rd. Apt. 501, Shanghai New Zealand RM Gallery and Projects – Auckland | Hsu’s house,54 Mt Smart Rd Onehunga, Auckland 1061 Italia Fondazione Pistoletto/Cittadellarte – Biella | MART (caffetteria), c.so Bettini- Rovereto | Navel – Circolo Culturale, P.za Foro Giulio Cesare 13, Cividale del Friuli | Sanfoca Hotel – http://www.sanfocahotel.com – Tuglie | Dobialab, via Vittorio Veneto 32 – Staranzano | B&B Ca’ del Sol, Viale Regina Margherita, 16 – Cagliari | B&B Casa Elisa, via Cavour 5 – Cividale del Friuli | Casa Cosco – Via Saul Greco 29 – Catanzaro | Spazio Ferramenta via Bellezia 8 – Torino | La Stanza, Piazza Benco 4 – Trieste | Circolo ARCI MissKappa, via Bertaldia 38 – Udine | Bar Ipogeo, corso Paolino d’Aquileja 15 – Cividale del Friuli | B&B Via del Paradiso, via del Paradiso – Ponte in Valtellina | Casa Poiana, Ca’ Bertossi 1 – Faedis | Radio Ondefurlane 90mhz: http://www.ondefurlane.eu (from 00.00 to 7.00 am) | Spazio PAN, via dei Savorgnan 52 – Roma Chile Local 1 – Santiago del Cile Estonia MoKS, Centre for Art and Social Practice – Mooste USA Experimental Intermedia, 224 Centre St # 3 New York, NY 10013 Norway Lydgalleriet, Skostredet 16 – Bergen | PNEK office in ORP2 (Olaf Ryes Plass 2) Oslo Nederland PS Projectspace – Madurastraat 72, Amsterdam Spain Casa Buffolo , Calle Bella Vista 1 – San Juan Alicante Argentina El p1so de abajo, Barrio de Villa Crespo – Buenos Aires Portugal Binaural Media – Nodar France rue Labat, Paris 75018 (send email before to: dinah@radio1001.org) Germany CORPO 6 galerie, HB55 Räume der Kunst, Herzbergstrasse 55, Berlin. 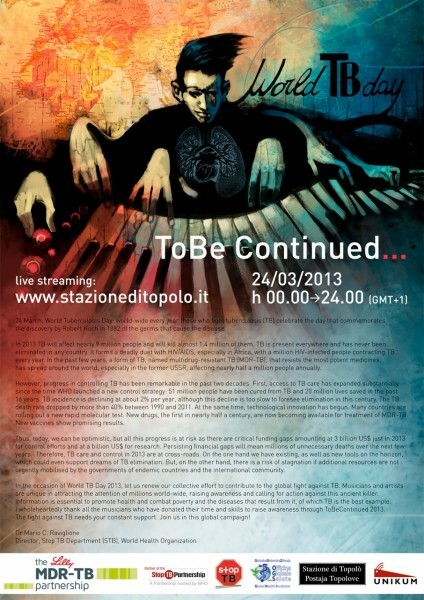 ToBe Continued is an original concert lasting 24 hours (from 00.00 hours to the midnight of March 24th), during which musicians from many parts of the World will be connected to a website that will broadcast, live, their concerts. During this un-interrupted 24 hour marathon (ToBe Continued… in fact) each musician has at disposal a 30-minute window, thus creating a relay of sounds and rhythms that will range from the different streams of “new music”. The event, that will cover the 24th of March, World TB Day, in its entirety, is coordinated by Antonio Della Marina, musician and computer music composer, and by Moreno Miorelli, artistic director of the annual gathering “Stazione di Topolò/Postaja Topolove”. The whole initiative is under the aegis of the Global Health Incubator, the ‘laboratory’ established in July 2009 in Topolo’ by Mario Raviglione (WHO director of Stop TB Department) to create links between the world of creativity and that of science. The participating musicians will perform live from many different countries: from USA, Chile, New Zealand, China, Iran, Mexico, Venezuela, Japan, Canada, South Korea, Brazil, Australia, South Africa, Lebanon, Armenia, Turkey and many European countries (Russia, Ukraina, Transnistria, Poland, Bulgaria, Latvia, France, Belgium, Slovenja, Greece, Romania, Portugal, Germany, Italy, Austria, Croatia, Albania, Norway, Finland, Iceland, Far Oer, Hungary, Sweden, Denmark), creating a symbolical tour of the world with 48 stops, starting and ending in Topolò. This year project also includes several public listening points (bars, libraries, cultural centers, art galleries, shops, all listed on the website) that will broadcast the concert. Tuberculosis (abbreviated as TB in English and TBC in Italian) is a curable disease. However, it is often underestimated, if not totally ignored, as a major human scourge, although it is globally the leading cause of death from an infectious disease, causing the loss of 1.7 million people each year, 4000 every day, with thousands of unnecessary victims also in the richest countries every year. The project ToBe Continued…is also part of the initiatives organized by Stop TB Italia to commemorate World TB Day. The event has the patronage of StopTB Partnershipand thanks to Eli Lilly MDR-TB Partnership and the collaboration with UNIKUM – Culture Centre of the University of Klagenfurt, that will provide the facilities for the coordination of the concerts.